Perfect for the horse crazy girl, nothing is a greater introduction to the wonderful world of horse play than Breyer Classics model horses and accessories! With our model horse collection you can join new friends and learn all about the many breeds and colors of horses, as well as how to take care of them. You can recreate the real world of horses with accessories that provide hours of imaginative fun. 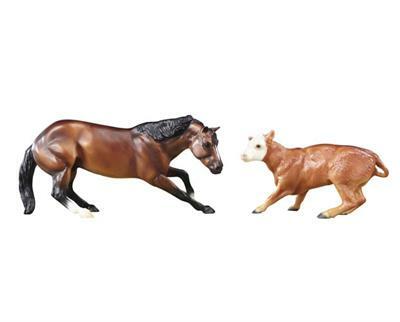 Contains 1 Classics Size scale bay Quarter Horse poised in a cutting prose and 1 Classics Size scale Hereford calf.